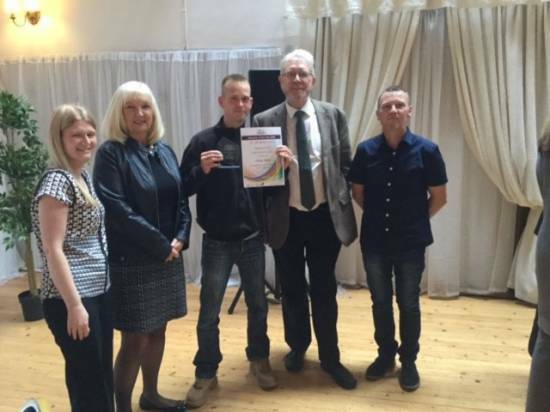 Argyll and Bute TSI Volunteer of the Year Award 2016, held on the 16th of September, celebrated the many volunteers across Argyll who give of their time and skills for the benefit of others. The event was held in Oban and a number of people travelled from Dunoon. Local charity HELP were absolutely delighted that Lukasz Bialik was recognised as the Regional Hero for Cowal and Bute. Lukasz gave hours of his time, skills and enthusiasm in all weathers to their Moir Street Environmental project and although he expected nothing in return he was surprised and thrilled to be recognised in this years awards. From everyone here at HELP we would like to say a massive well done and congratulations to Lukasz Bialik.